Whatever you do, don’t change your birthday on Twitter to 2007. 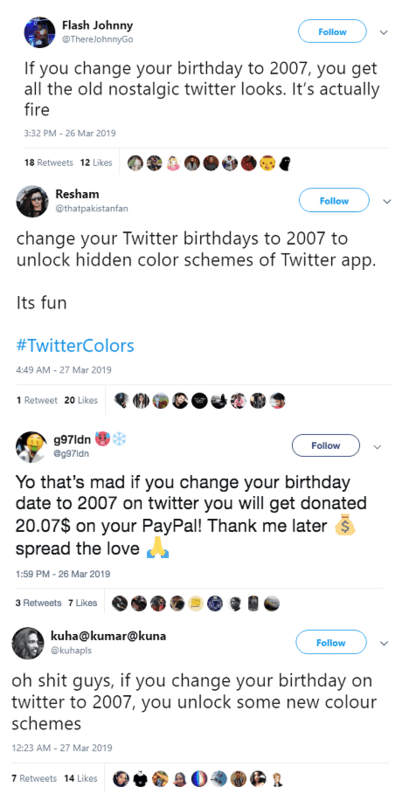 Of all the things to tweet about, some Twitter users chose to post about how you’ll get cool features, new color schemes, and even cash if you change your Twitter birthday to 2007. As to how these posts got a lot of retweets, one can only guess. This prank has gone viral, and it’s having an impact on Twitter users the world over. Twitter advised against doing what it says as the social media site doesn’t have color schemes based on birthdays. When you change your birthday to 2007, you will get locked out from your account for being only 12 years old. Several Twitter users can attest to this as you need to be at least 13 years old to have a Twitter account. If you too fell for the prank, there’s no need to worry. Twitter says that you can get your account back if you contact Twitter support and tell them that your birth year is actually 2008. Just kidding! Contact Twitter support, and give them a copy of your government-issued ID. Twitter will reinstate your account after that.